Adrian Peterson child abuse allegations: Why fantasy owners should release the star running back. Why fantasy football owners should release the Minnesota Vikings star. Running back Adrian Peterson, #28 of the Minnesota Vikings, looks on during a preseason game against the Tennessee Titans at LP Field on Aug. 28, 2014, in Nashville, Tenn.
Adrian Peterson is one of the NFL’s most reliable players. A perennial MVP candidate, he’s rushed for at least 10 touchdowns in each of his seven NFL seasons while falling below 1,400 yards from scrimmage just once. Peterson is also, unsurprisingly, a dominant fantasy football asset. Almost guaranteed to be off the board within the top five picks, he’s the perfect player to build a fantasy roster around. He racks up points on a weekly basis, and is also less dependent than other position players are on, say, a young quarterback’s uncalibrated arm. He’s dominant and safe—the perfect mix for any fantasy owner. As NFL fans, there’s not much we can do—aside from throwing Twitter temper tantrums—to protest this decision. But if you have Peterson on your fantasy roster, it’s time to engage in a small act of civil disobedience, doing what the Vikings should’ve done when they learned their star player had been indicted for beating a defenseless 4-year-old with a stick: Release him. For NFL fans, the past week offered a much-needed lesson in keeping football in perspective. During Roger Goodell’s tenure as commissioner, the league’s profile and profits have gone up, its coffers better stocked with each new TV deal. Meanwhile, the country has become so enamored with professional pigskin that the offseason has shrunk down to what amounts to a three-week window in July. It’s not just that we love football. It’s that we love it so much that we’re willing to overlook the fact that the league treats its current and former players like disposable widgets, and we don’t much care. Though we’ve proven quite capable of ignoring the scourge of brain injuries, perhaps fans will be able to draw a hard line at domestic violence and child abuse. As with Ray Rice’s elevator punch, the use of a weapon to discipline one’s child—to the point that he returns to his mother bearing cuts on his legs and scrotum, bruises on his back, and defensive wounds on his hands—is indefensible. If the allegations prove to be true (and based on Peterson’s own statement, it appears they are), there should be no place for him in the NFL. At the very least, given the gravity of the indictment, he should absolutely not be in the lineup this coming Sunday. The NFL’s rise as a 21st-century sports behemoth has been abetted by the rise of fantasy sports. The multibillion-dollar fantasy industry is the embodiment of our unhealthy obsession with fall Sundays. We care a huge amount about our fantasy teams, often to the exclusion of the real franchises that play each weekend and to the detriment of our social lives and in-office productivity. Cutting Peterson from your roster is a small gesture, but it’s a real one. And in a very small way, it parallels the decision that NFL teams have to make when their players are arrested for domestic violence or child abuse. 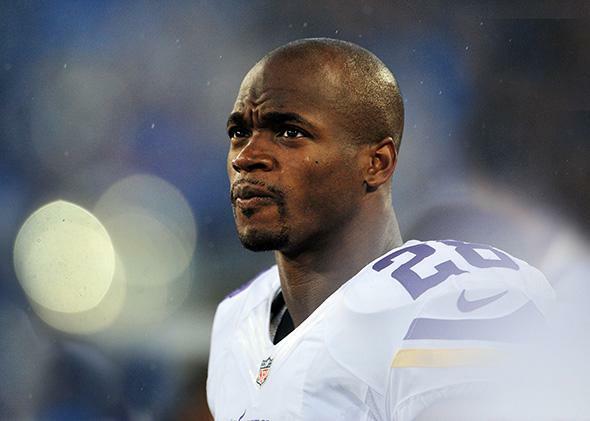 It will hurt the Vikings to cut Adrian Peterson. It will hurt your fantasy team to do the same. But how can we expect the league or the Minnesota franchise to take a stand if football fans aren’t even willing to sacrifice a few fantasy points?